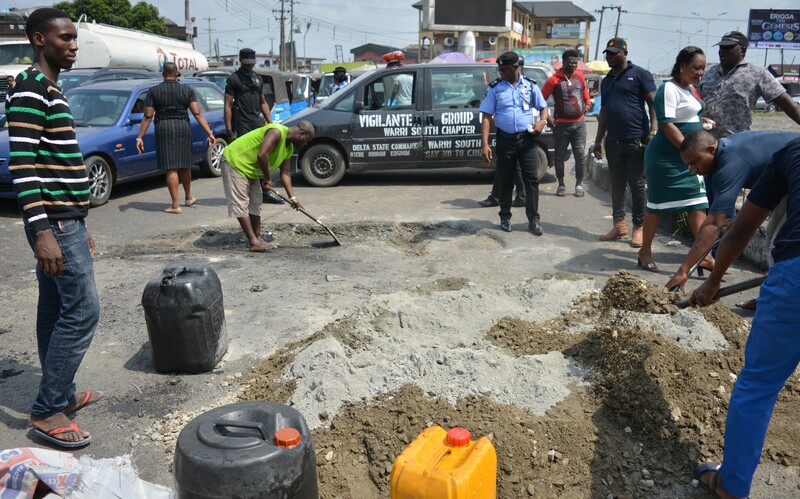 Commuters and other road users within Warri metropolis in Delta State have commended the Divisional Police Officer, DPO Avenue Police Station,Warri, CSP Efeizomor George for embarking on the repair of failed portions of some roads in the Oil City of Warri. The Commuters appreciated the Police B Division, Warri, for clearing of traffic at Okumagba Estate Roundabout in Warri and appealed to other institutions to emulate the Police DPO in launching of “Operation Moving, Traffic Must Flow” under his jurisdiction, which they believe will help in the fight against crime and criminality in the area. A commercial tricycle rider who identified himself simply as Mr. Chibuzor and Manager of Total Filling Station, Okumagba Estate Junction, Mr. Francis Eke gave plaudits to the Police for the exercise, especially as yuletide inches closer. The Commander Vigilante Group of Nigeria, Warri South Chapter, Louis Eboh commended the Avenue Police B’ Division DPO for initiating “Operation Moving, Traffic Must Flow”.